Following the release of his third studio album debut TESTING, A$AP Rocky shares the official video for "Praise The Lord (Da Shine)" featuring Skepta. The video was directed by A$AP associate Dexter Navy, who also directed the video for "A$AP Forever" feat Moby. The video follows simultaneous scenes of Rocky and Skepta in NYC and London, creating a mirrored hyper-reality that eventually leads them back together. Using TESTING as an outlet to push himself creatively, Rocky continues to break the mainstream mindset, entering a new era of innovation and creation with sonics rarely heard in hip-hop. Executive produced by A$AP Rocky and co-executive produced by Hector Delgado, Juicy J, Chace Johnson, and AWGE, TESTING was recorded over three years between New York, LA, London and Berlin. Rocky picks up right where he left off, weaving mind-melting aural psychedelics into hip-hop that is, at times dark and confessional, and in other moments uplifting and celebratory. Rocky is joined on TESTING with features from Juicy J, Moby, French Montana, FKA twigs, Skepta, Kid Cudi, and Kodak Black. A$AP Rocky's return to the top of the charts is complemented with applause from fans and media around the world, The New York Times declares "'Testing' is [A$AP Rocky's] most outré album to date, the one least concerned with prevailing trends." Also praising the project's innovation, Billboard cites that "...the Harlemite has been on the cusp of greatness for nearly a decade...His confidence and fearlessness has always been his calling card, and 'Testing' is more of him bravely stepping out of the box to try something new." Always hitting home with his core fanbase of stylish hip-hop fans, High Snobiety proclaims "'Testing' is an absolute triumph...All of his signature hallmarks are still here - the pitch-shifted vocals, the industrialized trip-hop elements - they have simply been cross-pollinated across a rich template of outside influences, giving Rocky the ability to evolve in several directions at once without compromising the record's cohesion." Rocky kicked off release week by releasing the album's cover art with a live-streamed performance art piece, titled Lab Rat, at Sotheby's in New York on May 20th. Met with critical acclaim from The New York Times, High Snobiety, The FADER, XXL, Complex, Stereogum, Hypebeast, Noisey and more, the performance featured Rocky encased in a glass room while being treated as a test subject; exploring and interpreting the creative process with a series of tests and simulations for a period of 90 minutes. In addition to a live audience, guests included A$AP Ferg, A$AP Twelvyy and Dev Hynes, along with a phone call appearance made by David Banner. Regarding the process, Pitchfork hailed, "A$AP Rocky was no longer just a rapper; he was high art." To add to his unconventional release festivities, Rocky celebrated the release of TESTING with a surprise show at London's legendary Village Underground, featuring an appearance from Skepta to perform "Praise The Lord (Da Shine)." Rocky made his festival debut over the weekend at Primavera Sound in Barcelona and will make appearances at various European music festivals throughout the summer including NOS Primavera Sound 2018 in Portugal, Parklife 2018 in the UK, Woo Hah in the Netherlands and more. Stay tuned for more news and live announcements to follow. 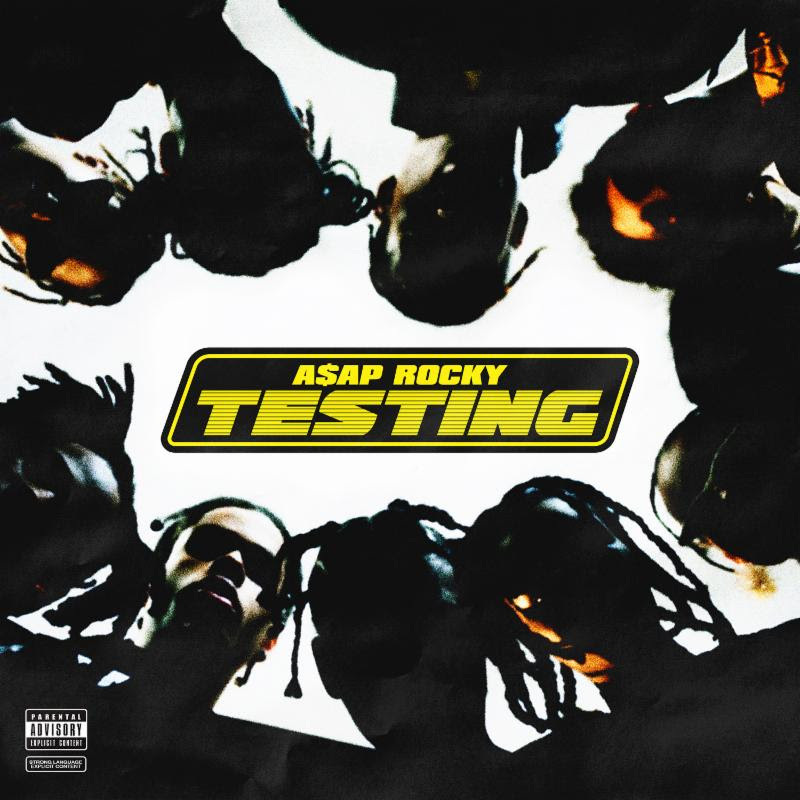 TESTING is out now via A$AP Worldwide/Polo Grounds Music/RCA Records.